Hydraulic-powered equipment plays a major part in keeping our world up and running. The power that's needed to power that heavy equipment has to come from somewhere. Sure, many newer tractors may lend their own power, but you won't want to tie up your expensive tractor all day just to power a single piece of equipment and burn unnecessary amounts of gas in the process. 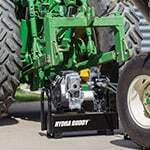 Hydra Buddy hydraulic power packs provide dependable hydraulic power, free-up your tractor for other tasks, use less fuel to get the job done, and require less maintenance than a large tractor engine. How Does Hydraulic Fluid Work? Because hydraulic fluid doesn't compress, it exerts the same force that is acting upon it. Next time you're stopped due to road construction, take a look at the equipment. When you see a bulldozer, a skidsteer, or an excavator, look for those high-pressure hoses moving the actuators. The power to move the earth is transferred through the fluid in those lines from a pump to an actuator. Similarly, when you press the brakes in your car, hydraulic fluid is being actuated by the master cylinder down to the brake calipers that in turn stops the car. 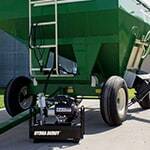 You'd be amazed how many applications use hydraulic power, if you know where to look. Most hydraulic power is generated by very large machines, but if you need hydraulic power that you can take with you, reach for a Hydra Buddy. These handy little portable hydraulic power packs can be used to generate hydraulic power anywhere you need it. They're great for farms and construction sites or any hydraulic-powered purpose. You can take Hydra Buddy with you in the back of a truck or trailer. They're great on a farm where you may need hydraulic power in more than one location at the same time during the day, yet only have one tractor capable of providing hydraulic power. Now you can use the tractor in one location and the Hydra Buddy in another. Every hydraulic power pack must have the same basic components in order to supply pressurized hydraulic fluid to the hydraulic machinery it's powering. To start off, The hydraulic reservoir can come in different sizes, and this must be sized to the equipment it's being used with. The hydraulic reservoir holds the hydraulic fluid that becomes pressurized and forced through the high pressure hoses. To get things moving, the motor starts and runs the pump. Without it, nothing will work. Motors come in different sizes to provide different levels of power to run different sized pumps, which leads to the next major component - the pump. The hydraulic pump is needed to move and pressurize the hydraulic fluid through the system. As the pump runs, it pulls hydraulic fluid from the reservoir into the inlet line, which then draws it into the pump. Then it pushes that hydraulic fluid out into the hydraulic system where it becomes pressurized. Every unit also has regulators, which are vitally important to the function of the power pack. The regulators are used to control the amount of pressure that's being delivered by the power pack. Once the hydraulic fluid is pressurized and ready to be sent to the hydraulic machinery being used, it needs a vessel by which it can be delivered. This leads to the next important component - the high pressure hoses (or lines). There are generally a couple of different kinds of high pressure lines - the supply lines and the relief lines. 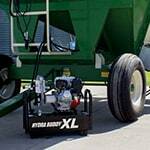 The supply lines will deliver the high pressure fluid to the machine, and Hydra Buddy power packs have very conveniently designed supply lines that can be quickly connected and disconnected to save you time switching between chores. The relief lines are equally as important for other reasons. They will relieve excess pressure between the hydraulic pump and the valves. They are also responsible for directing the flow of the hydraulic fluid through the system. Then to keep the hydraulic fluid free of corrosive particulates, you need hydraulic filters in place. These filters catch and remove particulates from the hydraulic fluid to keep them from damaging other components. Without the filters in place, the particulates can get stuck and build up, causing issues with surface tension and possible leaks in the lines. It's important to change these filters regularly to maintain optimal flow of hydraulic fluid through the system and remove particulates as they're captured. 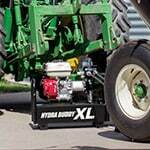 Portable Hydraulic Power Packs for Heavy Machinery - View Our How Hydra Buddy Power Packs Save You Time & Money. Our water pump how-to library can help you pick the perfect dewatering pump, submersible pump, trash pump or water pump accessory.